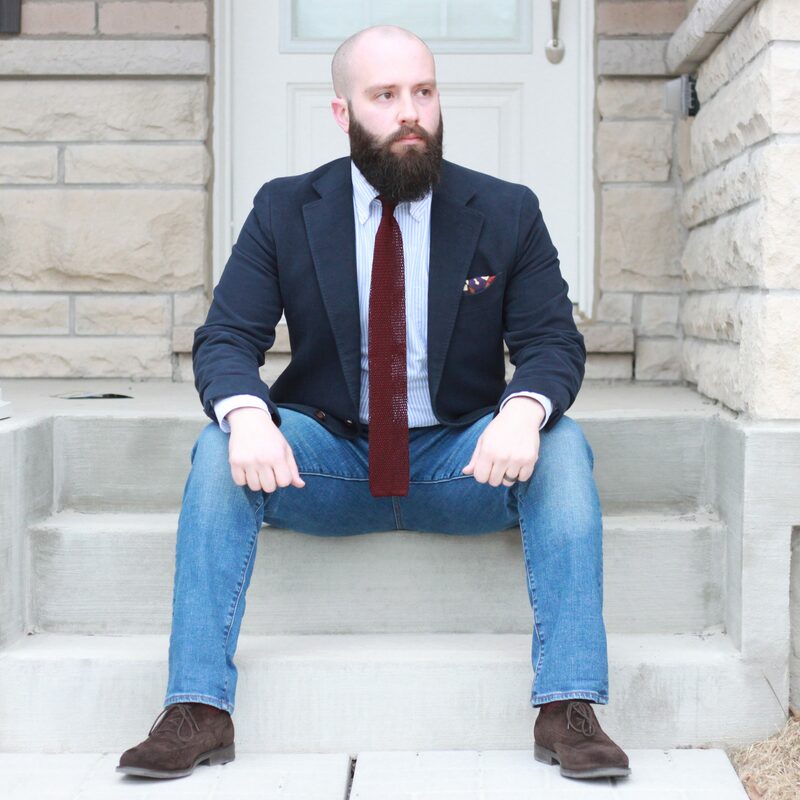 Wearing denim with a sport coat is not uncommon, but I find those outfits fall clearly into two categories – either they work, or they don’t. I wrote about a few times I wore them together. I think with the right pieces it can be a sharp but casual look. The question for this post is, “can you also wear a tie?” The answer is… I guess, if you really want to. Adding a tie to a denim/sport coat outfit could be a bridge too far. Sport Coats, jeans and ties are all over the place with regards to inherent formality. It comes down to dressing with intent. If you plan to wear a tie, why are you wearing jeans? If there is a social reason to be “dressed up” enough for a tie, wouldn’t a pair of trousers be better suited? Being comfortable should be a factor in all clothing. What I mean in this context is that the sport coat should contain some softer elements – think soft construction, natural shoulders. Throwing on a suit jacket will not work out well. Balancing the casual and dressy elements is also pretty critical. Shoes, shirt, belt, should all be closer to the middle of a formal-informal spectrum. I really like tweed and denim together. This was a time where I forced myself to pick a tie, because I knew I’d be writing this post at some point. The outfit works well from a colour standpoint – the brown, burgundy and blue all come together nicely. Choosing a knit tie was key. It needed to be able to carry some visual weight, and the crunchy knit texture works well with the Donegal sport coat. As I mentioned before, it’s all about balance. In my mind, the knit tie is about as informal as you can get. The brushed, blue-striped OCBD shirt is also a less formal choice. All around, I think this look worked. But I have to ask myself, “would this be better with trousers?” and I think the answer is yes. Owning only a couple of knits means my selection of “casual” ties is a limiting factor in putting together a sport coat, jeans and tie outfit. Again, I reached for this burgundy crunchy knit from Oxford Rowe. I really like these ties, if you haven’t checked them out, I wrote a review about them. Anyways, I think a sport coat, jeans and tie outfit is a bit limiting to begin with, hence why the same tie appears twice! A lighter wash denim can be a great choice for dressing up. Don’t think you have to go with a dark wash. These are pretty middle of the road, and I like them with the navy moleskin jacket. The pocket square doesn’t look great here. It adds too many competing colours, and comes across a little out of place. Similar to the last outfit, this looks… ok. I think any other trousers probably would have been better. Mid grey tweed. Flannel. Whatever. This look I quite liked. Probably the most successful of the sport coat, jeans and tie looks I’ve done. Not sure that’s saying much. 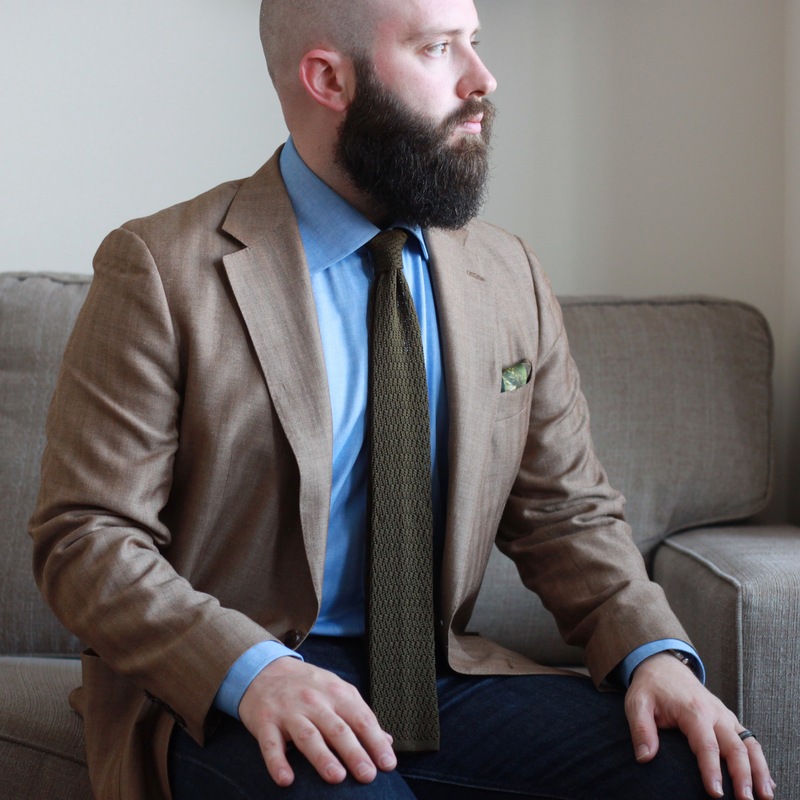 Tan or brown sport coats are awesome with denim. Since I chose a dark wash denim, I wanted to balance out the saturation, and did so by choosing my chambray shirt. This olive zig zag knit tie (also from Oxford Rowe) pairs really well with the jeans and sport coat. There’s a nagging thought that I just can’t seem to escape though… Why would jeans be the best choice for this? Well, they aren’t. I can’t see why, objectively, I should go with these versus a pair of navy trousers. If you’re dead set on it, check out @burzanblog @sorinjitaru and @nordinkent for some inspiration. These gents all manage to do it well. Jeans can make for a practical choice when you must conduct business and look professional but circumstances might need you to get your “hands” dirty. Jeans are wonderfully egalitarian and have a way of making the wearer seem more approachable than slacks. You are right, for sure. 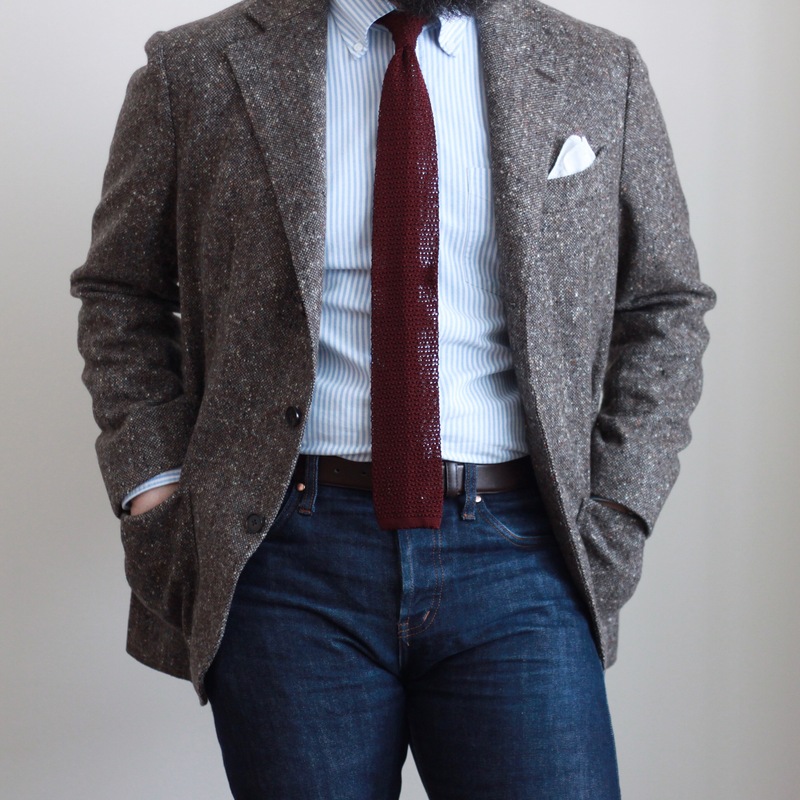 I quite enjoy jeans and a sport coat together, I found that adding a tie was maybe a bit too much. Thanks for commenting!